The Command Post: Beautiful Ocean and Mountain Views. Nestled on the rocky shore, Command Post holds sway over all boats coming and going on Somes Sound and, is situated amongst historic and once vibrant rock quarries. Relax on the deck after a day of whale watching and listen to the frogs serenade you. Enjoy the gorgeous views of the mountains meeting the sea, and watch boats at work and at play. Golf at any one of three courses located on the Island. Enjoy sailing, swimming and fishing in either the ocean or fresh water lakes close by. In season you can pick blueberries on the grounds for your enjoyment. The Command Post provides a secluded getaway that is centrally located to any of the attractions of Mount Desert Island: Echo Lake, Acadia Mountain, Southwest Harbor, Northeast Harbor, Bar Harbor, Cadillac Mountain, and the Carriage Roads and Hiking Trails of Acadia National Park. Your “relaxing” time can be as busy as you choose to make it or as peaceful and serene as the natural setting that is the Command Post! The Command Post was exactly as advertised; beautiful views of Somes Sound and the east side mountains. The house was cozy and very clean. We had everything we needed for a relaxing stay and will not hesitate to return if we get a chance. We loved the views and history here. We also accidentally locked ourselves out and the owners were very accommodating getting us back in! Thank you for an excellent trip! I am glad you came to stay with us, and I hope we will see you again soon. It was beautiful and well maintained, warm and cozy. The views were amazing with snow covering the surrounding hills and mountains. The bed was too soft for me and the center feet under the bed had collapsed, which I wish I had noticed when I had arrived, so I could have fixed it. Unfortunately I didn't, and my back went out. I loved this place and it was exactly as described. I would definitely rent it again. It was perfect. I am so sorry to hear about the bed and your back, hopefully it didn't take away from your time on MDI. I will have to make it a practice to check the center feet under the bed when cleaning. Enjoy the rest of your winter and hope to see you again soon. Wonderful winter stay on Mt Desert! very clean and cozy and well stocked! 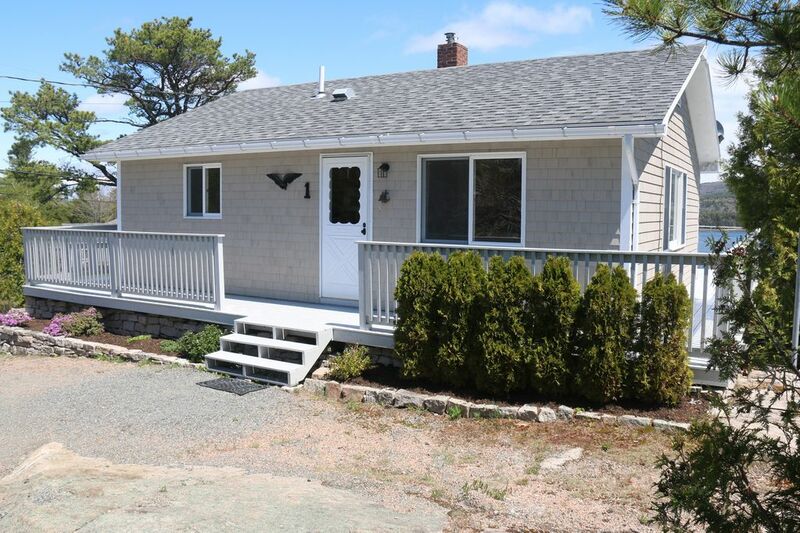 Great views with central location to the island! Mimi was very responsive and welcoming! Love Mt Desert Island! We absolutely loved The Command Post! We will definitely be returning for more hiking! We brought our two dogs and they loved it, too!! The cabin is so cozy and relaxing!! Wish we could have stayed longer!! Mimi is fantastic. She stopped by to say hello and introduce herself. Her mom is very sweet as well!! The view from the cabin spectacular!! The night sky is amazing - millions of stars that are so bright!! The cabin is close to everything. It is only a short drive to the other side of the island. We hiked Acadia Mtn and Gorham Mtn with the dogs! Amazing!! We drove to the top of Cadillac Mtn for the sunset - spectacular! We went to so many places! We want to come back and do the hikes that dogs cannot go on. One of our favorite beaches is Little Hunters Beach - the rocks are so unique! Can't take any rocks from the beach though!! We met people from several different states and some from different countries. In November, some shops are closed, but we still found a lot of shops to play tourists for a day!! We cannot wait to visit MDI again!!! Thank you, Mimi, for everything!! We loved The Command Post. It was the perfect location for our week on Mt. Desert Island. We came to Acadia to hike, and were able to complete a great many of the hikes that the park has to offer. At the end of a long day of hiking, The Command Post was a comfortable place to come home to. We cooked our evening meal each night in the well appointed kitchen, and enjoyed the gas stove on the chilliest of mornings. The furnishings were comfortable, and the location made it easy to get to the various hikes, and it is a pleasure to be able to avoid the crowds in Bar Harbor. The views are amazing, and we only wish it had been warmer so we could enjoy the deck and shore. My only suggestion, and it is a minor one, is that the mattress could use replacing. Everything else about the cabin was perfect and I wouldn't change a thing! Thanks Chris :). I'm glad you enjoyed your stay and hope you will come back to see us soon. Located in the center of Mount Desert Island, we are just minutes away from all attractions. With Somes Sound within walking distance, you can enjoy the beautiful sights and water activities such as boating and fishing, and if you are really adventurous, a breath-talking swim in the ocean. Should you not like cold salt water swimming, Echo Lake is within 1 mile of the house. Please contact us for rate details Weekly Rates from $800 - $1600 per week I have a no refund policy, however, if I am able to re-rent your week, I'll give you a full refund less a $100 cancellation fee. The more time you can give me when cancelling, the better the chances of getting your money returned to you.